5 days ago Ihasnotomato asked me to write a blog post that includes his progress update on his various projects. After that is done, I will talk about all of the videos that he has released since I last posted. EDITED: Quite simply, progress is always being made on Edited, it is my magnum opus, my white whale, my masterpiece if you will. and as a result, a lot of time and care is put into it, occasionally you might see the odd piece pop up now and then related to Edited but a lot of what I make and work on for Edited is all spoilery so there isn't much to show I'm afraid, but if you've ever wondered about it, just know I'm always working on it in some regard. MARY AND THE APOCALYPSE: Currently put on the back burner for a while, it's a fairly sized project that really does not need much attention for now, it's essentially going to be my first graphic novel, so I can get a foothold in the area if that makes sense, I want it to be made simultaneously with Edited but come out before it in book form and all that. Of course I'm not ignoring it completely, if any ideas for it arise I make sure to jot them down or draw them or whatever, its just not the main focus right now. SAMURAI GRIT: Going to be honest here, Samurai grit has not been worked on for a long time now, full disclosure, I made it when i felt a very particular mood, and said to myself I will work on it whenever I get in that mood, however as you can imagine that mood has not come to me very often. To be fair little work was done on it anyway so its no real biggie to me, its just that it's a super serious story and honestly i don't feel like making a 100% serious story right now. Samurai Grit is not completely dead however it's just at the very bottom of my to-do list and honestly may end up being dropped one day, particularly because I've reused some themes for it into this new thing I am making which you can read more about further below. FAN ART: You May have noticed the large amount of fan art I have been making on a near weekly basis, well quite frankly there are many reasons for this which I feel I have gone over before but to summarize: Weekly content is better than no content, teaching me to let loose a bit and teaching me new styles as well, combined content for my channel (because I've been doing speed drawings), and a way to reach out to a wider audience. Essentially the fan art, is fun and going strong and I have no plans to stop anytime soon. NEW PROJECT: KASS: My new project, currently names 'KASS' is something I've been cooking up for a couple of months now. I don't want to talk in full about it just yet, I'm still sorting things out but progress is going very fast and well for it. Essentially it's less of a graphic novel and more of a web comic I suppose? The idea is to release a page of it maybe once or twice a week so it will give people something to 1. Look forward to 2.Content that is more like what I really want to do. It's an exercise for me as well to finally just dive into the comic/ graphic novel style medium so that I can learn along to way while working on my other projects as well in the background and applying what I've learned from Kass to them. As a result the idea is to get it out fast and give people to chew on and get an idea of what I do, and as such like i said, progress is hopping along nicely, yet I can't give a release date just yet. This isn't the first time that Ihasnotomato has asked me to post something, and I don't think it will be the last. Anyway, onto the YouTube stuff. Lately there have been more Ihasnotomato Draws videos, so that's definitely a series. Then the final episode of Anticipating the Pyro Update was released. Ihasnotomato and Erren talk about TF2 stuff based on the comments people made in their final discussion video. Just so you know, the final two videos of the series are based on the comments of the previous episodes, in which they just talk about their ideas on what should happen in the upcoming Pyro Update. Then many more episodes of "Overwatch Season 4 Placements DRUNK w/ Reflex" were uploaded. In my opinion, they're not drunk enough. But that's just me. There was another Story Time. Instead of an apologetic story, this one is the story of how somebody tried to scam Ihasnotomato. However, Ihasnotomato was clever enough to calmly keep track of the situation and heroically defeat the criminals before they got anywhere near his high value Team Fortress 2 items and inventory. I'm not biased, these are just the facts. Also he's super handsome and that's what everybody thinks. The other day he uploaded a video about how much he loves Team Fortress 2, because apparently the game has received a lot of negative comments based on its lack of game-changing updates. Let's be honest, the game has had quite a few updates that have effectively redefined the game, particularly the early ones which presented the option of wearing hats, and later updates which changed the way people play characters including the Scout, Pyro, Heavy, Soldier, and Demoman. I think that we can take it easy when it comes to whinging about the lack of game-changing updates. The game and team behind it has done a brilliant job of entertaining the masses. Finally, a video has been released on IhasnotomatoMk2 about tumblr. Not very exciting if you ask me, but it's a video! As a hip, young, twenty-something male, Ihasnotomato is familiar with the various platforms which people use to communicate. He admitted it himself on one episode of Sonic Adventure 2 Battle, he looks at memes on his phone. That's everything so far. I'll write another post when more videos come out or if he wants me to write something. In the last two weeks, Ihasnotomato released 4 videos. 2 are Team Fortress 2 videos, one being an Anticipating the Pyro Update video and the other being a video about his YouTube popularity affecting his noticeability in-game. Another video is Drunk Overwatch gameplay with his friend Reflex. They play the season 4 placements. I don’t know what that is. Lastly, he released a speed draw video of him drawing Noodle from the Gorillaz. He has labelled the video type “Ihasnotomato Draws”. Whether he does another one is up to him, so I wouldn’t describe it as a series yet. In non-video news, he reached 5000 Subscribers on his Ihasnotomato channel. At this stage, having 5000 subscribers seems to be a less significant milestone. It just seemed inevitable that he would reach that stage. Nevertheless, it is a large number and should be acknowledged. There isn’t much to say on what’s been going on with Ihasnotomato and his channels. The answer is that very little has happened. Two videos have been released. One is him explaining why he hasn’t been uploading many videos. The other his him announcing that he has answered peoples’ questions for the IM Industries Q&A. A friend passed away and he’s been unmotivated to commit to video-making due to the emotional stress which that brought on. The Legend of Zelda: Breath of the Wild has been distracting him from getting stuff done as he loves it so much. The announcement video is an announcement video. It doesn’t need describing. Here’s the video in which he answers the questions. Sorry this blog post took so long, because of the lack of videos (and the immense distraction of Ihasnotomato playing Breath of the Wild non-stop while worrying about Uni work) I’ve been holding off on making a blog post. Hopefully he makes a video before this month’s over so I can get on top of my goal of writing 12 posts this year. PS: The Free to Play experience TF2 video has over 44,000 views! Before the night ticks into March, I have just enough time to throw together another blog post. 5 new videos have been released since January 31st. 3 of them are Anticipating the Pyro update episodes. 2 of them are subscriber milestone videos. Ihasnotomato reached 4000 subscribers recently and, on Valentine’s day of all things, released a video with the theme of the day in mind. The video wasn’t terrible. It was great. I’m not spoiling much of it because I think you should watch it. The other video was to announce that IM Industries (recently renamed from AIM Industries) has reached 50 subscribers and will be going a Q&A. Feel free to check that video out too! He’s got a lot of questions about the Pyro now, so he’ll be busy when he records his answers. Also, since the Free To Play Experience video is doing so well, I’ll update you on the numbers. It has more than 27,000 views! 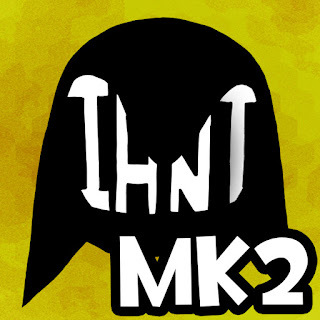 I’m still waiting for some sweet behind the scenes or bonus stuff on Ihasnotomato Mk2.